iOS 11.4 brought two-way iCloud sync to the stock Messages app. 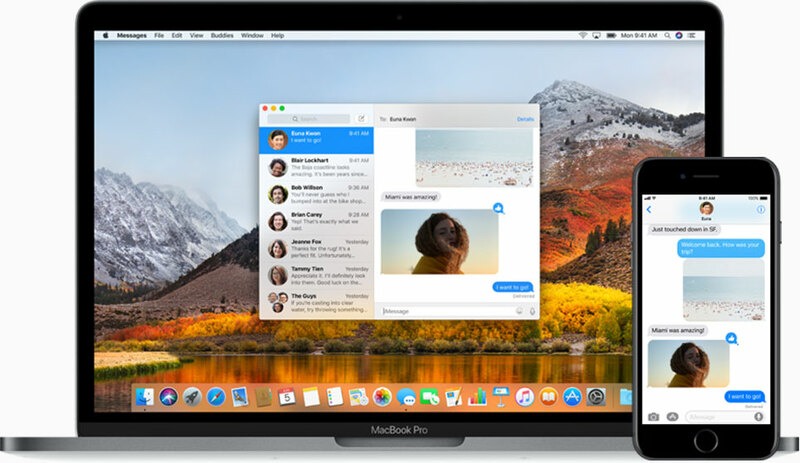 With Apple Messages iCloud sync, signing in on a brand-new device with your Apple ID gives you full access to your entire chat history complete with iMessage, SMS and MMS messages, attachments and other items. 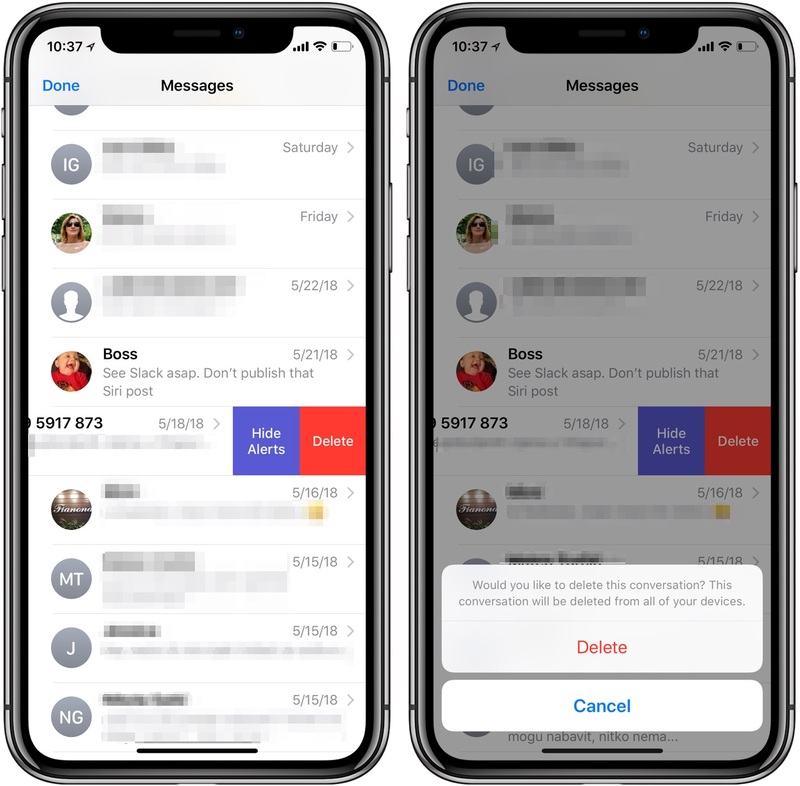 As you message people, delete old conversation threads and more, everything gets seamlessly and instantly reflected in Messages across all your iPhone, iPad and iPod touch devices. NOTE: This article was originally published on June 20, 2017. We’ve refreshed it on May 30, 2018 with the relevant steps pertaining to setting up Messages in iCloud on iOS 11.4. It’s not uncommon for the Messages app to retain years worth of deleted conversations on your iPhone, iPad or iPod touch with no way to manually slim down the database unless you’re willing to jailbreak or take advantage of a third-party desktop tool, such as AnyTrans. To maximize speed and minimize power/storage consumption, iOS marks your removed chats for deletion rather than wipe them clean right there and then. The operating system might slim down Messages database in low-storage situations, but don’t count in it. Worry not, boys and girls, Apple comes to the rescue! iCloud now keeps your entire message history updated and available on all your devices, even when you set up a new device. Similar to iCloud Photo Library, Messages in iCloud keeps your Messages content continually synchronized across your iPhones, iPads and iPods in a manner that helps optimize storage consumption. What’s more, deleting an embarrassing message from your transcript on an iPhone automatically wipes it clean from your iPad, and vice versa! Messages in iCloud are updated automatically so you always have the same view everywhere you use iMessage. When you delete a message, photo or conversation on one device, it’s removed from all of your devices. And since all of your attachments are stored in iCloud, you can save space on your device. 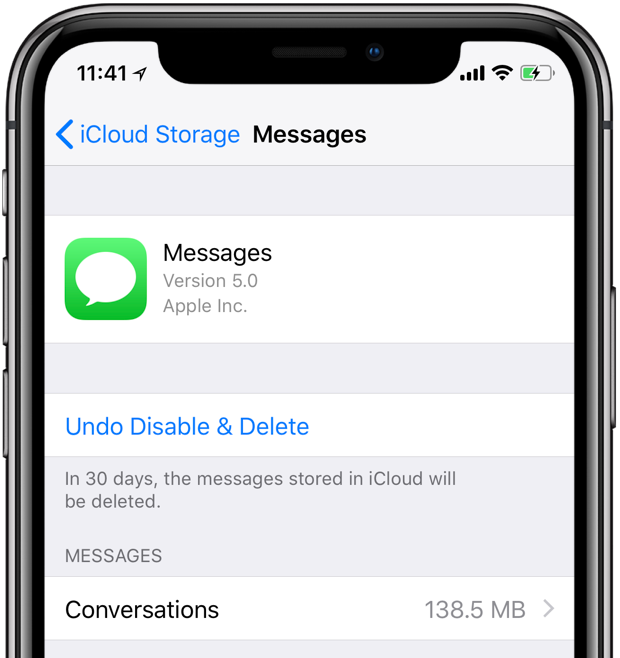 Messages in iCloud is a free feature, but be advised that your synced texts, threads, attachments and other content count against your iCloud storage allotment. If you’re on a free 5GB plan, you might want to upgrade to one of the paid tiers (in case you didn’t know, your first month is on Apple) and stop worrying about hitting a storage limit. Before we begin, verify that your devices support Messages in iCloud. You can currently use Messages in iCloud on your iPhone, iPad and iPod touch. It’s worth keeping in mind that Messages in iCloud is currently unsupported on Apple Watch—a text or chat thread deleted from your iPhone remains present in Messages on your Apple Watch, and vice versa. On iOS devices, Messages in iCloud requires the iOS software version 11.4 or higher. The feature is scheduled to hit Macs as soon as the macOS High Sierra 10.13.5 update is released for public consumption. At that point, we’ll refresh the tutorial with any Mac-specific steps. In terms of the iCloud․com website, Apple in its infinite wisdom hasn’t provided a Messages web app, likely for security purposes. As a result, you cannot access your messaging archive, individual chats or conversation threads from a web browser on your computer. Are you’re the type who prefers to keep their entire messaging history for future reference? If so, Messages sync is for you! Maybe you avoid performing a clean install when a major iOS update drops because there’s no easy way to preserve your Messages history? Hate having to restore your new devices from your old device’s backup just to have your message carried over? Just set up Messages in iCloud and with first sync done, you can basically set up any device as new, turn on Messages in iCloud settings and, voilà!—your entire conversation history is magically revived on a new, freshly installed iOS. Messages in iCloud also results in smaller, faster iCloud backups. That’s because only the most recent chats get pulled from your complete Messages archive in iCloud. As you scroll through older chats, Messages loads content on demand from iCloud. And just like with iCloud Photo Library, if you delete a chat here, it automatically disappears there, too! As I mentioned earlier, among the key benefits of using this feature is knowing all your chats are safely synced through and backed up in iCloud. Should you happen to lose your iPhone or accidentally wipe out everything, a quick sign-in from another device is all it takes to—and it works surprisingly well!—basically stream your messaging history on demand in the Messages app in a storage-friendly manner. Best of all, you needn’t give up your privacy and security when using this cool feature because Messages in iCloud keeps your exchanges end-to-end encrypted. Here’s how to set up and use Messages in iCloud on your Apple devices. You must enable the feature separately on each and every device you’d like to use it on. iOS goes to work and downloads your chat archive from iCloud, if any. If there’s no existing Messages archive in iCloud, a new one is created. Otherwise, an existing archive is pulled from iCloud and updated with the chats stored on your device. Either way, from there onwards any changes in Messages on that device are uploaded to iCloud and relayed to other devices. The implementation ensures Messages is kept up to date no matter the device. Depending on the number of your texts and size of attachments, the initial background sync may take anywhere between a few seconds and a couple of minutes and more. To accelerate the process, it might be a good idea to connect your device to power. 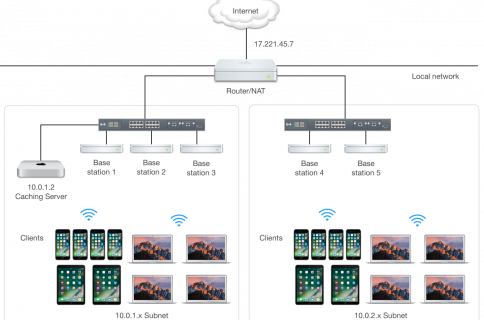 With the feature has been enabled, a message received on one device shows up everywhere unless other enabled devices are either offline or signed in to another iCloud account. Conversely, deleting a thread on an iPhone yields a warning message cautioning you that the convo will also disappear not just from your phone but other devices as well. “Would you like to delete this conversation,” the message reads. ”This conversation will be deleted from all of your devices.” Perhaps rather disturbingly, this cautionary prompt for some reason doesn’t show up when deleting individual chats. You can disable Messages sync on a per-device basis or anywhere it’s on, in one fell swoop. 1) Open Settings on your iPhone or iPad with iOS 11.4 or newer. 4) Slide the switch labeled Messages to the OFF position. 5) You’ll be asked if you want to turn off Messages in iCloud for just that device or all devices. Disable This Device—Turn off Messages in iCloud for this device only. Disable All—Turn off Messages in iCloud across all your devices. Select either option or choose Cancel to abort the operation. Disabling the feature prompts iOS to first download the full, most recent Messages database from iCloud. 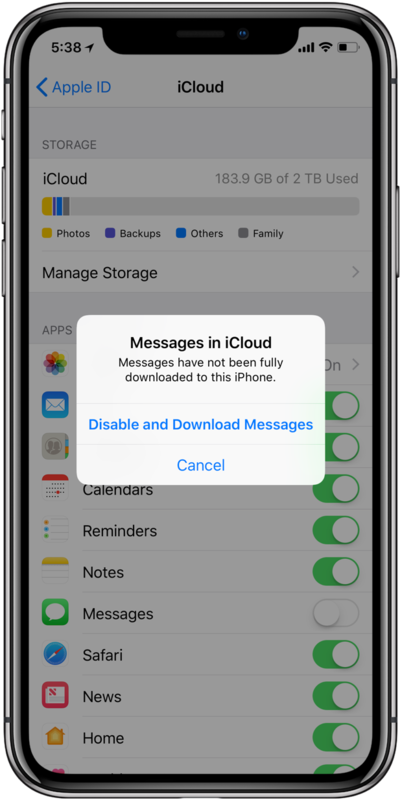 “By disabling Messages in iCloud, your Messages data will be downloaded to your device and will no longer sync to iCloud,” reads Apple’s description of the feature. With sync off, your messages will be included in a separate iCloud backup. Be advised that a cautionary message may show up in case you have disabled the feature before Messages has had a chance to retrieve your conversation history from iCloud. If you see the prompt, choose Disable and Download Messages from the popup menu and you’ll be on the safe side. By default, Messages won’t disable iCloud sync before it’s downloaded your chat archive. As a precaution, any device that still has Messages in iCloud turned on shall continue to store what you send and receive from that device in iCloud. 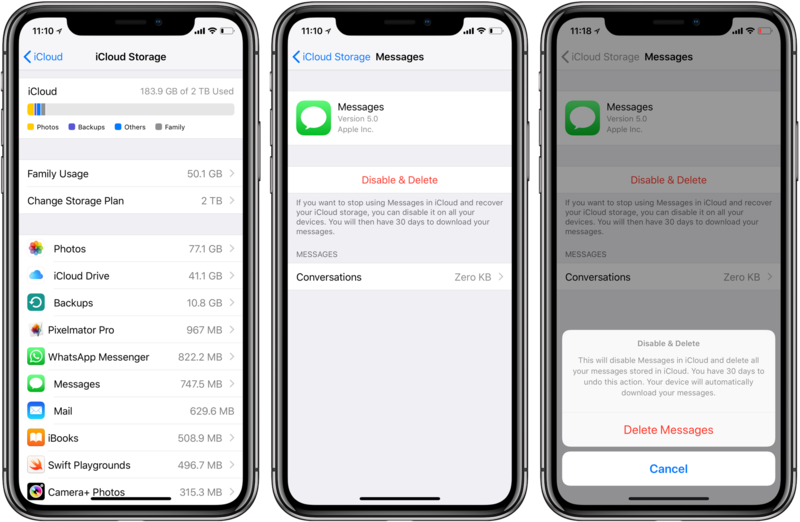 If you want, you can elect to disable Messages in iCloud across all of your devices at once, especially in case you’d like to permanently remove your chat history from Apple’s servers and recover your iCloud storage. 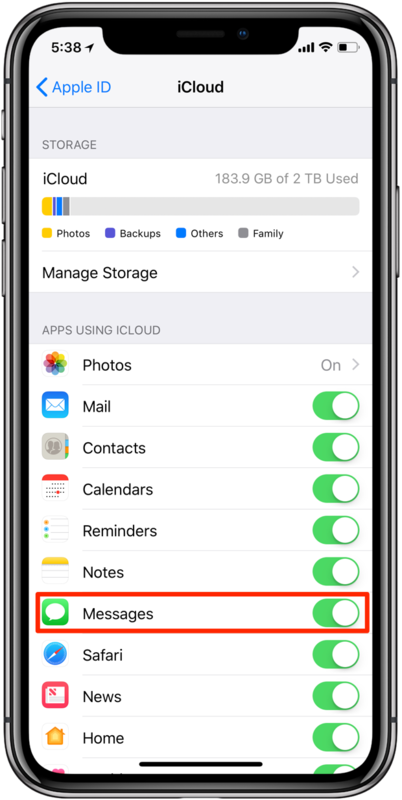 To do so, open the Settings app on any iOS device where Messages in iCloud is turned on, then select your Apple ID profile name at the top and tap iCloud → Manage Storage → Messages → Disable & Delete. Doing so will disable Messages in iCloud on all your devices at once. 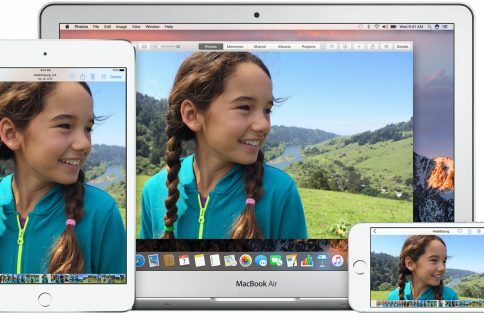 You’ll have 30 days to download your messages before they’re deleted from Apple’s servers. To prevent any confusion, the device this action is initiated from will automatically download your messages before completely turning off Messages in iCloud everywhere. To undo this operation and bring back your full conversation archive, you must visit this section in Settings within the 30-day cutoff window and tap the option labeled Undo Disable & Delete. Alternatively, just slide the Messages toggle to the ON position in your iCloud settings. To see how much storage space your texts and attachments are currently taking up on your device, go to Settings → General → iPhone Storage, then select Messages in the list. Messages’ current storage consumption is shown next to Documents & Data. Thanks to iOS’s smart caching and storage management, the on-device database is much smaller than the full iCloud archive. This is where you can review large attachments, too. Many people will especially appreciate detailed storage breakdown of their chats, photos, videos, GIFs, stickers and so forth. And with Apple’s artificially intelligent storage recommendations, users can quickly perform housekeeping actions specific to their particular situation. As an example, if there are too many storage-hogging apps installed on a user’s device, iOS may offer to offload unused apps. 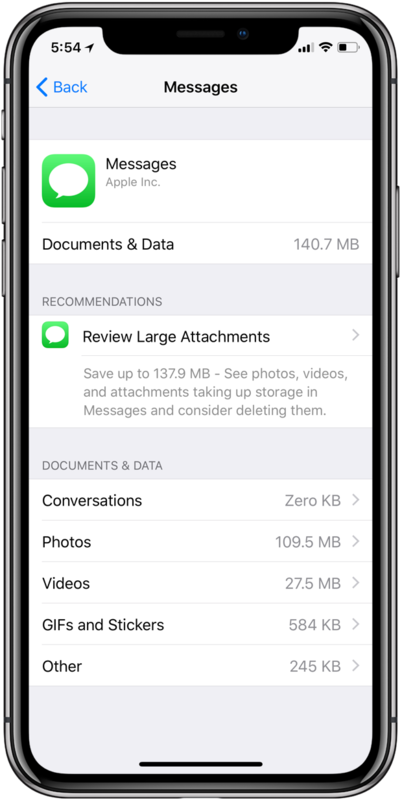 Folks who prefer to keep full, storage-hogging archives of multi-year conversations on their device might see different recommendations advising them to delete large attachments or enable Messages in iCloud. 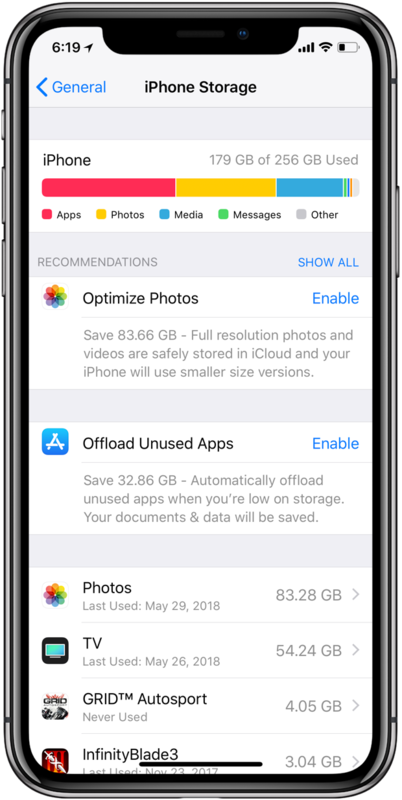 To get tips for how to save storage space on your iOS device, go to Settings → General → iPhone Storage and scroll to the section headlined Recommendations to see the available tips. The tips are updated dynamically, as your storage situation evolves over time.